(Left to right) Andrew Gilmour, assistant secretary-general for human rights and head of the Office of the High Commissioner for Human Rights (OHCHR) in New York, and Mona Khalil, former senior legal officer in the UN Office of the Legal Counsel, with Vijay Prashad and co-editor Karim Makdisi. George and Martha Kellner Chair in South Asian History and Trinity College Professor of International Studies Vijay Prashad recently released a new book called Land of Blue Helmets: The United Nations and the Arab World with co-editor Karim Makdisi. The book is a close and informed study of the UN in the region that taught the organization how to do its many jobs. This volume collects essays from some of the finest scholars and practitioners writing about the potential and the problems of a UN that is framed by both the promises of its charter and the contradictions of its member states. 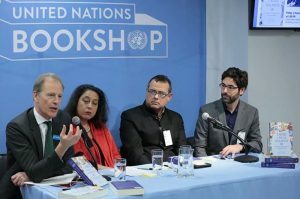 Prashad and Makdisi discussed their book and the role of the UN in the Arab world at the United Nations Bookshop at the UN Headquarters in New York City on December 2. Makdisi is associate professor of international politics and director of the Program in Public Policy and International Affairs at the American University of Beirut (AUB), visiting scholar at the Fares Center for Eastern Mediterranean Studies, Fletcher School of Law and Diplomacy, Tufts University, and research director of the UN in the Arab World Program at the Issam Fares Institute for Public Policy and International Affairs. 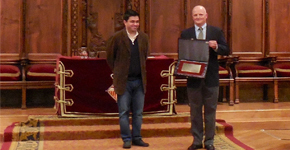 A panel discussion about the book was also held at Harvard University in Boston on December 6. 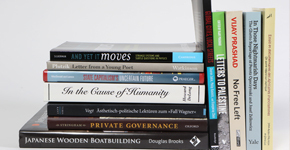 To watch a video of the United Nations Bookshop panel discussion, click here.